All Posts Tagged With: "french vineyards"
The Bicycle Gourmet invites you to join him on his adventures in France. 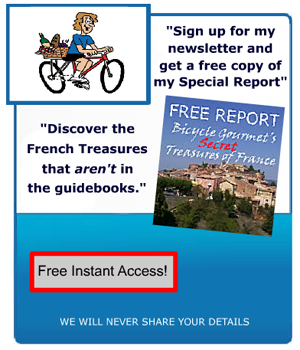 Sign up for his FREE newsletter and get a copy of the BG's special report - Secret Treasures of France. absolutely megan.....it really underscores the fact that women in those days were expected to be "baby machines." Hopefully you'll be giving us more insight on this captivating subject in your next installment. Looking forward to more on this subject. Excellent start! Always enjoy your posts.....this one especially, Waiting for no. 2. Keep up your good work! © Copyright Bicycle Gourmet. All rights reserved.